U.S. health officials on Thursday issued a safety warning on a specialty endoscope that has been linked to the transmission of a drug-resistant superbug known as carbapenem-resistant Enterobacteriaceae, or CRE. CRE infections contributed to the deaths of two patients at the Ronald Reagan UCLA Medical Center in Los Angeles who had undergone a procedure with this particular type of endoscope, known as the duodenoscope. In all, 179 patients may have been exposed, the hospital said. And it has happened before. Between 2012 and 2014, 11 patient deaths were linked to the bacteria at Virginia Mason Medical Center in Seattle following duodenoscope procedures. The bacteria could be transmitted if safety protocols for cleaning the scopes aren't carefully followed. But Los Angeles County health inspectors found "no breaches" in the hospital's disinfection process, the health department said. Some experts say even when a hospital does everything right, it may not be enough, and suggest that a design flaw is causing the overarching problem. "This is a particular scope, used predominantly in procedures to treat blockages of the pancreatic and biliary ducts due to cancerous tumors, gallstones, or other conditions, and it has to curve to get around corners in the body. And those little corners there, bacteria can accumulate," CBS News medical contributor Dr. David Agus told "CBS This Morning." "And it's either, it wasn't cleaned well or the criteria for cleaning it are wrong, and we need to certainly address that. There should be a red flag because this is several outbreaks have happened over the last several years, and we really have to have that red flag to make a change here," he said. From January 2013 through December 2014, the U.S. Food and Drug Administration received 75 medical device reports of bacterial infections from duodenoscopes involving about 135 patients, and since then more have occurred. At UCLA, at least seven patients were infected and two of them died; more than 170 others may have been exposed. At Virginia Mason, 35 patients fell ill and 11 died after acquiring the infection. Endoscopes are flexible tubes with lights that are used in procedures involving the mouth, throat and stomach. They are used by medical professionals to inject contrast dyes or insert other instruments that will allow a doctor to take a tissue biopsy. The duodenoscope, in particular, helps a doctor examine the duodenum, portion of the small intestine closest to the stomach. This type of scope is frequently used in patients with pancreatic cancer and gallstones. The end of scope contains what are called elevator wire channels -- small flaps that hold stents and other components of the device. These channels may harbor hidden bacteria that persists even after cleaning according to protocols. "You can very easily do everything right and still have some contamination," said Dr. Deverick Anderson, an infectious-disease expert at Duke University, told the Associated Press. "We're finding this is a problem, but it's probably one that we don't have a very good solution to right now." A spokesperson for Olympus, the device manufacturer, acknowledged that cleaning the duodenoscope does require more attention than other types of endoscopes. "While all endoscopes, including duodenoscopes, require thorough reprocessing after patient use in order to be safe, the Olympus TJF-Q180V requires careful attention to cleaning and reprocessing steps, including meticulous manual cleaning, to ensure effective reprocessing," the company said in a written statement. The company said that it plans to provide supplemental educational materials, including an interactive checklist with video demonstrations, to hospitals that use them. In a statement issued on Thursday, the FDA said it had decided not to issue a recall because the risk for infection is still incredibly low. As many as 500,000 Americans each year undergo procedures with this type of endscope. 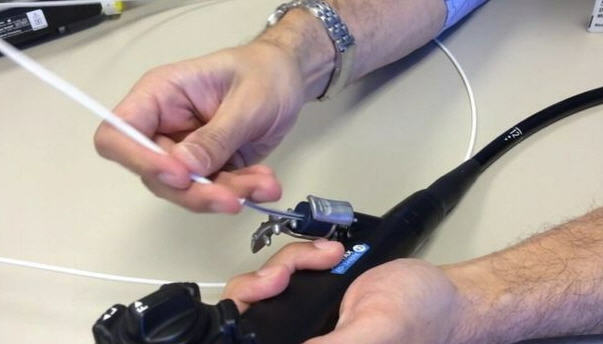 The FDA said cleaning guidelines for the duodenoscopes are established by professional medical societies and government agencies such as the CDC. But after the Seattle cases came to light in January, Virginia Mason Medical Center said it believed those guidelines were not sufficient and that it had chosen to institute even more stringent standards. "We determined that the endoscope manufacturer's, as well as the federal government's, recommended guidelines for processing the scopes are inadequate," the hospital statement said. "This is a national problem. We've developed and implemented a better and more thorough process for preparing scopes that is the most rigorous in the nation. We believe our method for preparing endoscopes for medical procedures should now become the national standard." Federal officials said they are reviewing documents from multiple sources, including Medical Device Reports, company literature and documentation from the health care community, professional medical societies and the CDC, to evaluate if changes need to be made to duodenoscope cleaning protocols. In a statement, the FDA said it has "conducted a full review of the best available data and is actively engaged with other government agencies, including CDC, and the manufacturers of duodenoscopes used in the United States to identify the causes and risk factors for transmission of infectious agents and develop solutions to minimize patient exposure." But Olympus and the FDA have not publicly stated if the endoscope's design will be reevaluated to ensure its safety.